Joanna Wiebe helps startups get more sales, not with cheap "growth hacks" but with good, old-fashioned copy. As the co-founder of Copy Hackers and Airstory, she’s helped companies like Wistia, Buffer and Metalab create persuasive, believable and usable copy that converts visitors into customers. She has also (quite literally) written the book on how early-stage startups can get their messaging straight. Joanna and I sat down to talk about how she built her business from Hacker News, the biggest mistakes startups are making with their email marketing, and why you shouldn’t be afraid to rely on clichés every now and again. If you enjoy the conversation, check out more episodes of our podcast. You can subscribe on iTunes or grab the RSS feed in your player of choice. Below is a lightly edited transcript of the chat. Geoffrey: Joanna, thanks so much for joining us. What led you to start Copy Hackers? Was copywriting and conversion something that, when you started your career, you saw a lot of people struggling with? Joanna: Absolutely. I was at a couple different companies before I went out on my own. I was at an agency, and I was at Intuit, a big tech company. Then I was working from home, and I had a lot of free time, because I could get my job done very, very quickly. I would spend a lot of time on Hacker News or the Y Combinator news forum, where a bunch of startups hang out. But I’ve really always been into startup culture. It’s cool to see what people can do when they have an idea and a laptop. So I would hang out there, and at one point this one guy named Shereef Bishay, who runs Dev Bootcamp, did an Ask HN. For anybody who’s unfamiliar with Hacker News, Ask HN is just when you put something out to the whole group and ask what they think. He did an Ask HN for his new website, which was for a project management product he’d built for engineers. I looked at this site and thought, “I don’t have a clue what any of this is about”. Again, I had a lot of time on my hands, so I put together a quick deck for him. Then like a month later, I came home and there were like 30-50 emails waiting for me from complete strangers. I opened them up, and I saw Shereef had posted over on Hacker News and it had been voted to the top. This post was about how awesome and giving the Hacker News community is, and he used my slide deck and our discussion as an example. Other people who were also struggling with their website copy, which Shereef had been struggling with, reached out to me, and said, “If you did that for Shereef can you do that for me?” For the first five or so I said, “Yeah, totally!” By email six I couldn’t keep saying yes to everybody and doing all this free stuff. I had to start saying “No”, and those people were like, “Well if you can’t do this for me, you should at least teach me how to do it. Maybe put an ebook together.” That’s where the idea for Copy Hackers was born. I spent the next year working on case studies with those five or so people, put ebooks together and then launched a year later on Hacker News. Geoffrey: A lot of our listeners are working at startups and one of the things they’re really struggling with is condensing their stories, vision or products into simple taglines or position segments. How do you get the ball rolling? Joanna: Take the pressure off yourself and just know it’s going to be hard. I still talk to people who are in full growth-mode businesses, and when you ask them to state what their solution is, they say something, and you can see in their eyes that they don’t even believe it’s 100 percent true. Take the pressure off yourself, for one. Secondly, a tagline is different from an elevator pitch, but there can be some overlap. If you’re looking to write your four-word statement that goes on Angel List to describe your solution, you can go a clever way and do a play on words, which most taglines are actually born from. Find a cliché, honestly. Back when I was at the agency, I had to do a lot of these short statements for a huge range of products and services, and I lived on a site called Cliché Site, which sounds really bad. A lot of really good taglines are born out of some wordplay on those old statements that everybody’s heard a million times. You make it sound a little bit fresh by introducing something different. If you’re hard up for ideas, start there. Then it’s just a matter of really doing the harder work around identifying your value proposition and figuring out how to put that into a more succinct statement. There’s the value prop, there’s the tagline, and then there’s that quick forward statement. That can come from a place like … the “pitch” thing that you hear about a lot, like the way that the movie Alien was pitched. It’s just “Jaws in space”, right? Startups are doing that, where they’re saying Airbnb for anything. Fill that in. It might feel like, “Oh brother. Not another one of those,” but no if you’re actually saying something that’s clear, and meaningful. One of the hardest things about working in writing is letting all of the crap out of your head. Don’t let those negative voices go, “That’s stupid. You can’t say “Airbnb for blank”. There’s so much stuff that comes up when you’re trying to be creative and express something about your business, which you’re so close to. Start with “We’re Airbnb for blank” or “We’re Uber for blank”, and then go from there. Let yourself have that initial starting point, which is not where you’re going to end up. You just need to get something down. Geoffrey: Are there any companies in or outside of the software industry that you think have really nailed their marketing tagline? Joanna: There are some that have a really big idea that’s well expressed in a single statement. One I often cite is for this shoe insole here in Canada. The line is, “Turns your high heels into sneakers”. They know their audience. As a woman, I would love for my high heels to feel like sneakers. That’s this bigger idea that’s really succinctly expressed, and it makes you want to discover more. It’s like, “Show me how. What are you talking about? How can that be true?” You have to suspend disbelief for a second. When you’re aiming for that bigger idea that can be well said, that’s a pretty good example. Geoffrey: They’re touching on a common problem that people encounter. It’s not very abstract. It’s just describing a problem. Joanna: Totally! It’s not trying to be clever, it’s just saying exactly the thing. We talk constantly about finding your message in what your customers or prospects are saying. As a copywriter who’s been doing this for 15 years, I can fully imagine they were sitting there doing interviews with people or listening to women say, “My feet hurt so badly at the end of the day. Why do they get to walk around in sneakers and I have to wear heels all day?” You know that it wasn’t just some copywriter just sitting at her desk, dreaming up an idea. It’s coming from that real pain or that problem, which is where the customer is born, and is exactly what I just talked about at the Converted Conference. Starting the conversation in the moment of pain, and then switching into your solution. Geoffrey: The best marketing copy, in my opinion, has a very clear personality and a point of view that you can glean straight away. I specifically think about companies like Basecamp and MailChimp. You touched on this in your Business of Software talk a few years back, and you used the example of bottled water to describe it. I think it was proven that the participants in the study you reference had a natural inclination to taglines that had a clear, distinct personality over those that didn’t. Could you explain that a little bit more to our listeners? Joanna: Yeah, you’ll like pay more for water that has a brand that you recognize and can identify with, which is a little bit shocking. It’s all water. The study was about bottles of water with different branding on them, and what emotion you felt when you were being offered this water. That’s really what it comes down to. Can we take the most basic thing that we’re all buying and try to sell more of a certain kind? That completely came down to, what are you calling it? What are you saying about it? Let me kind of back up and express this study. It was around these five personality types that were associated with this bottle of water. Those five personality types are similar to the five primary human personalities: sincere, competent, excited, sophisticated and rugged. People had higher purchasing intentions, and I think they were like three times more likely to recall the name of the brands, with personalities than the brand without personality. The one personality which performed best out of sincere, competent, excited, sophisticated and rugged, with this particular audience, was the competent brand. The no personality brand basically just did nothing. So if you just call it “Water”, that’s not going to move people to buy. If you do something around “Sincerity” or “Ruggedness” or “Competence” then that’s saying that personality is the shorthand. Your copy’s personality is a critical shorthand for your prospects, with these intrinsic and extrinsic cues that we have as we make decisions. Geoffrey: So if you’re a water business owner, aim for competence and maybe rugged it’s safe to say? Joanna: Rugged is just so weird. What is on that bottle, a man in a cowboy hat? I don’t even know. What does competence look like? Maybe when it comes to water, competence is the way you want to go. But maybe when it comes to your solution, if you can think about those five personality types and what your prospects are more likely to respond to, chances are really, really good that they won’t respond to zero personality. We’ve seen that time and again. They need something. You don’t necessarily have to sit around and choose in a board room, but can you identify what your target audience is most likely to respond well to? Geoffrey: You’ve written extensively on helping marketers write email that gets opened and leads to conversions. What are some of the biggest mistakes you’ve seen businesses make with their marketing emails? Joanna: How much time do we have? It’s hard. Taking email seriously is the number one thing, and that doesn’t mean take it seriously as in treat it like a serious thing, it means treat it like a serious business opportunity. It was about two years into Copy Hackers when I realized that we’re an email business. We would be zero without email, nothing would happen. We’d get some people to our site, but we would never be able to sell them anything or send more content their way or do anything good for them without collecting email addresses. You have to identify the thing that grows your business, and so many times email is that thing. There are rare exceptions where email isn’t that thing. I’m sure if you’re in gaming, email isn’t going to drive people back, there’s other things that are going to be built in. But if you’re in software, or service businesses, email is how you drive sales. So number one is take it seriously. Make it a real part of your marketing. People spend a lot of time optimizing their homepage, or redoing their pricing table, and that’s fine if your emails are performing well. If your emails aren’t performing well, go work on that immediately. Then once you’re in there, really assess your emails honestly. Not as somebody who is worried about the UX; assess them as your actual recipient, as the person who is going to get this email on their mobile phone or at their desk, and allow yourself to read through them. With that comes getting rid of all the crap you think is important when it comes to writing copy. Seven times a day, I hear, “Joanna, people don’t read online.” People do read online, and they will read your emails if they are interesting. People will not read anything, anywhere that is boring, ever. It doesn’t matter where it is. If it’s boring, they won’t read it. People think, “I’m writing about business stuff, or I’m writing a sales email, so of course it’s going to be boring.” Well, don’t make it boring anymore. Try like testing it where it’s not boring this time. That’s one of the biggest things. First take it seriously, then make the them engaging. Often means that you have to shift up your approach. A one-to-one email often goes over far better than a business-to-many, or a business-to-one email. 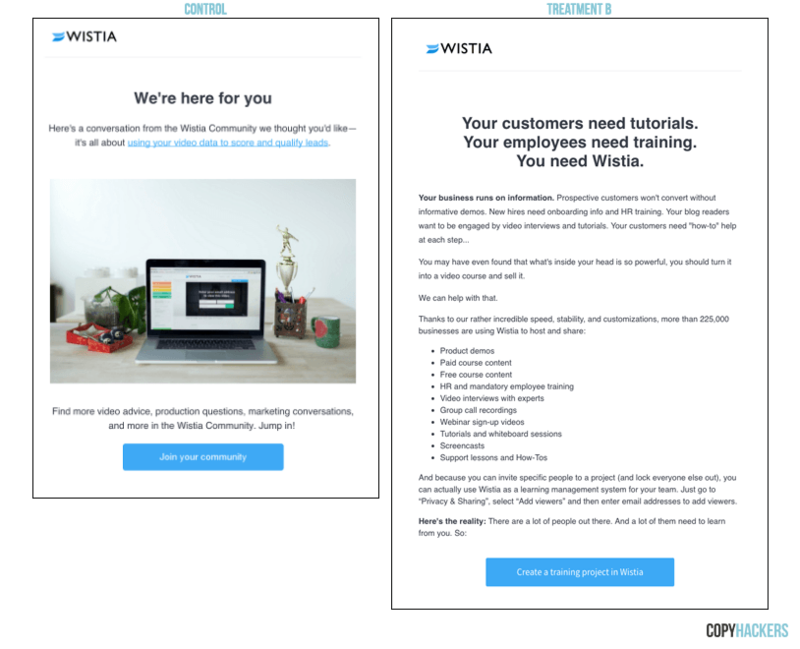 If it’s Wistia sending an email, versus Chris at Wistia, that’s an interesting test. Test that versus just Wistia sending that email. Or test a Success Manager against the company. Writing it in the narrative style is another thing, where you open with a hook. Treating every email like it’s a mini sales letter. We did this with Wistia, and I wrote about it on the Copy Hackers’ blog. We tested eight onboarding emails. They have three sequences that are triggered based on different activities that you do, and we worked on the third trigger sequence. This whole sequence comes at the end of the trial in most cases, and it’s where you’re trying to move people from trial user to paying customer. Those are my favorite places to optimize. They’re usually a good way to get a real read on whether what you’re doing is going to move people or not. Because at the end of the day, they either give you a credit card, or they don’t give you your credit card. Then you can learn something real. We tested these eight emails against their control. All we did was a basic rewrite. It’s like what a lot of copywriters would do when they go in for their first day. It’s like, “Well we don’t know what to do with you yet, so just go like rewrite these emails.” It was an exercise anybody could do right now, where you sit down, you assess the emails, and then basically rewrite them with different strategies, like using problem agitate solution or a framework like that. We kept the message largely the same, but we just changed the way that message was being expressed. Seven of the eight emails we tested were two to five times as long as the control. So we had longer copy, but long doesn’t work just because it’s long. It works when you actually say things that make people feel something and draw them in. You have to allow yourself to use more words, which was very uncomfortable for the Wistia team, understandably. So we tested these eight emails. They were longer, and we removed the videos from them in most cases. Wistia is a video company, so that was uncomfortable for them. We ran the tests, our eight emails against their eight emails, and ours brought in 3.5 times the paid conversion. And it was just a rewrite, right? It’s really just looking at your copy and saying okay, people are actually going to read this. People are busy, but they’re going to take the time to open this email. I want to make sure that I’m hooking them. I want to make sure they know I’m talking to them in their language. I want to use real specifics. And when it comes time for me to actually sell, because these emails at some point in the sequence have to sell, I want to make sure that we are really zeroing in on a pain, and then expressing how Wistia is the solution. The copy rewrite came from really listening to what their customers were saying, going on Amazon and doing review mining. Founder Chris Savage did a podcast, and he talked about YouTube. It was early in Wistia’s time when like people were still thinking, “Why wouldn’t I just use YouTube?”. He said something about how you expose your video to a world of crass strangers. I thought that was interesting. It turned into the headline for one of the sales emails. It was something like, “What’s red and unsupported and stuck in the middle of a bunch of crass strangers?” The answer was, “Your videos on YouTube”. It was setting it up with this fun sort of joke framework, what’s red and white and whatever all over. You’re still playing with something that doesn’t feel angry or offensive or defensive. We are saying Wistia is better than YouTube, but we’re saying that in a friendly way that is actually still about getting into the problem with YouTube for businesses. So anyway, there’s lots to do there with email. Geoffrey: Subject lines are something we’ve studied extensively as well,. The one thing that we’ve found is the most successful tactic that we’ve had is literally just describing the subject of your email. It’s just quite simple stuff. I think Hillary Clinton and Barack Obama had the most successful campaigns in recent memory just by writing things like “Dinner?”, which I think is the most genius subject line of the past fifty years. 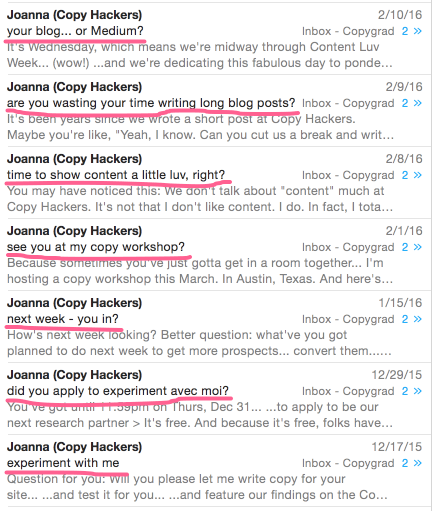 Joanna: This is a really quick hack that anybody can do – very long subject lines and very short subjects lines. We did something with the people at GetResponse where they analyzed a billion subject lines and found that the ones that were fewer than 10 or 15 characters, and longer than 60 performed best. That’s an interesting thing. It doesn’t mean that will always work for you, but maybe start with either going really short, like “Dinner?” or really long, whatever that might look like. A lot of what we learn as copywriters, we learn by paying attention. I was subscribed to Nathan Barry’s emails back before he was at ConvertKit, when he was just doing his Authority courses. Very often he would send a subject line that was a single word, and then he added a question mark. It’s really just a simple hack. The next time you want to do a one-word subject line, add a question mark to the end. It turns it into this curiosity sort of thing, where you’re like “What?”, and you open the email. It works really well for getting opens up. But that “Dinner?”, is of course spectacular, like anything that feels that relevant and personal. Did I just get invited to dinner? What’s going on here? Genius. Geoffrey: It’s been about eight months now since you launched Airstory, and it’s an amazing tool for writers to help them with the research process. How did you make the transition from consulting to building software? Joanna: Having been obsessed with startups for years and having worked with so many of them, you’re justin that world. If I hung out with a lot of chefs, I would probably start making chef-like food. There’s the part of you that loves building things, loves the risk of it, and loves the craziness of solving a problem that you’ve seen again and again and again. I was really dissatisfied with the digital page. A single sheet of paper on a page and that’s it? That’s what we get to work with? Designers have Sketch, and Photoshop, and they get to upload to InVision. The writers just sit around using words? It’s not good enough. There’s so much more to what we do than just hacking together solutions on a page. The shift to software then came as we were doing these courses, and in the courses we kept teaching the same processes, like doing a competitor content audit, where you pen up a document, make a table, and go over here and copy and paste your way through these 27 different things. That’s sub-optimal when you could just go to that site instead, highlight the different points, send them straight to your document, and then make sense of the work over there. We’re removing some of those steps. We’ve been teaching so much with these different things to find your message and turn that message into a high-converting page or line of copy. So it became, “We could keep telling people how to hack it together, or we could just actually try to solve it.” It’s big, difficult challenge, and it’s taken while to get here because there’s been iterations of the product, and there’s still so much to go. But we needed to solve the problem, so we did. Geoffrey: This approach of consulting, blogging, and writing first, and building software after, is something I really admire. Companies like Moz have been doing it as well. It means you’re basically an expert in your field before you actually build anything, and I think generally the products are better as a result. Joanna: I hope so. We obviously struggle with all the same things that anybody starting a software business or a startup struggles with. The actual product market fit, and identifying who your market is in the first place. That’s all fine and good, that’s all part of it. Hopefully in the end there is a good solution there for people. That’s our goal. Geoffrey: Finally, when you’re not running Copy Hackers and building products, you also write some fiction on the side. How do you find that the one informs the other, or does it at all? Joanna: No, they don’t. Thankfully, right? It’s a break. I don’t know that they do inform each other. I’m sure that in some ways they do, but what I like about what I call “fun writing” is that I get to just be creative. Pure and simple, I do not believe that anybody on the planet needs to hire a copywriter for them to be creative. I know that a lot of people don’t agree with me on that, but I’ve been down a lot of different paths in this world, and I know that time and again, we’re all creative in some way. A startup founder can sit there and come up with his or her own creative campaign. It might not be as great as if you get a really talented copywriter who’s done this a billion times and can tell good from bad, but really, you don’t need to hire people for the creative stuff. People don’t like when I say that, but it’s true. You hire them to grow your business. That’s where find that when I’m writing for fun I get to actually enjoy being creative and write paragraphs that are paragraphs, where I’m not worried about if a person has the attention span to deal with it, if they’re walking around their office on their phone reading this thing and I better put it all into really short sentences that have line breaks between them. That’s not the concern. You just let yourself be creative. That’s a good thing for any copywriter to do. Because then you’ve got a creative outlet still, which you want, but you don’t mistake your job as that creative outlet. Geoffrey: That’s great. We’ll wrap it up there Joanna. This has been absolutely fascinating. Thank you so, so much for taking the time. Joanna: Thank you. It’s been fun.